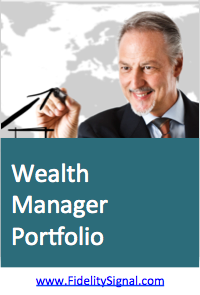 As we wrote in our blog entry on November 28, investing in real estate funds can be tricky. We wanted to see the Fidelity Select Construction and Housing Fund (FSHOX, last change: 2.19%) moving above the region of high volatility on the chart to turn even more bullish on the sector. The decisive move did occur today with FSHOX making an impressive gain and breaking out to a new 52-week high. 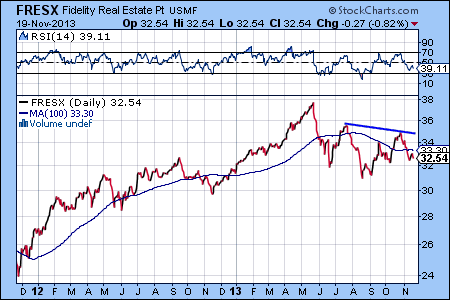 Identifying the best real estate investment funds for a given market environment can be tricky. This is especially true today with conflicting stories in the news media about the health of the real estate market. Indeed, we can see the diverging trends when we take a closer look at some of our favorite Fidelity mutual funds that invest in this space. We have highlighted the Fidelity International Real Estate Fund (FIREX, last change: 0.22%) in past blog entries, as one of the best performing Fidelity funds in 2012. FIREX continues its stellar performance and has gained 34.32% year-to-date. The gains are driven by increased appetite for Chinese and European property shares. Adding to international real estate positions can make sense for aggressive investors, as long as the price stays above the bullish red trendline. The Fidelity Select Construction and Housing Fund (FSHOX, last change: 0.44%) made a new 52-week high today driven by holdings in great performing stocks, such as Home Depot and Lowe’s. FSHOX has moved now to the number three spot in out daily momentum screen of Fidelity funds. However, we’d like to see a more decisive breakout from the recent high-volatility range before we would consider an overweight position in FSHOX. The technical indicators for the Fidelity Real Estate Investment Fund (FRESX, last change: -0.29%) are negative with FRESX below its 100 day moving average and the trendline showing a downtrend. We would avoid investing in FRESX until we can see consolidation on the chart and the price starts moving above the moving average. The Fidelity International Real Estate Fund (FIREX, last change: 0.00%) is the top performing Fidelity mutual fund of 2012 now with a 32.25% year-to-date gain. FIREX took the top spot from the Fidelity Biotechnology Fund (FBIOX), as the biotech sector has turned bearish in recent weeks. Although the trend for FIREX is still up, breaking the red trendline on the chart would caution us to take profits. We highlighted the Fidelity Real Estate Income Fund (FRIFX, last change: 0.26%) earlier this year as one of the most consistent performers. 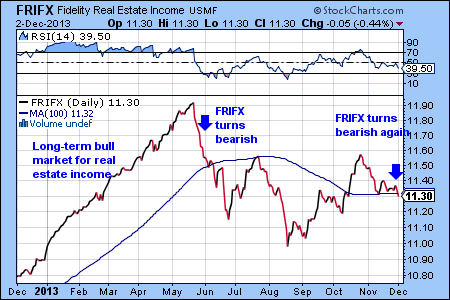 FRIFX has continued its solid performance, just as the other Fidelity funds investing in real estate. What makes FRIFX stand out is the low volatility of the returns it has provided. This makes FRIFX one of the best Fidelity fund investments in 2012 on a risk-adjusted basis.